C.S. Lewis demonstrates the illogic of this standpoint by pointing out what Jesus said about Himself. If we don’t believe what Jesus said, He was a lunatic or a liar. If either one of those are true, we have to even reject the prophet, teacher, and good man option. So, either Jesus Christ is God in human form as He claimed, or else the man Jesus was crazy or a liar. People in His day who refused to believe tried to shut Him up, too. They spit at Him, slapped His face, and said He was crazy. He no longer walks physically upon the earth among us, but we also spit, slap and ascribe lunacy to Him when we refuse to believe He is the Son of God, the Savior of all who will believe. Jesus claimed to be God. In John 10:30 we read that He said, “I and the Father are one.” Some would say, “Now that’s crazy!” The Jews called it blasphemy. “‘We are not stoning You for any of these,’ replied the Jews, ‘but for blasphemy, because you, a mere man, claim to be God’” (John 10:33). Jesus did not attempt to correct their understanding of what He said, demonstrating that they had understood Him correctly. Jesus had previously made another clear statement, recorded in John 8:58-59, “‘I tell you the truth,’ Jesus answered, ‘before Abraham was born, I am!’” In that instance, the Jews tried to stone Him as well. They clearly understand that Jesus was using the “I Am” as an Old Testament title for God (seeExodus 3:14). In John 1:1 we read, “the Word was God.” Then in John 1:14 the Apostle John writes, “the Word became flesh” obviously meaning Jesus was God in the flesh. Later, the Apostle Thomas comes to the same realization and proclaims to Jesus, “My Lord, and my God!” (John 20:28). In Titus 2:13, the Apostle Paul calls Jesus “our great God and Savior, Jesus Christ.” The Apostle Peter said the same, “our God and Savior Jesus Christ” (2 Peter 1:1). Why did God take on human form in the person of Jesus Christ? Our sin is ultimately committed against an infinite and eternal God, making it worthy of an infinite and eternal penalty – eternal death. Only God could pay such a penalty. God became a human being, in the person of Jesus Christ, so He could die in our place, paying the full penalty for our sin, thus providing salvation to all who receive Him (John 1:12). 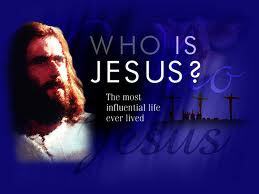 Because Jesus is God, He could proclaim, “I am the way and the truth and the life. No one comes to the Father except through Me” (John 14:6). Who is Jesus Christ? God in human form. This entry was posted in Discipleship and tagged Abraham, Christ, Christ Jesus, God, Gospel of Luke, Gospel of Matthew, Jesus Christ, New Testament, Old Testament, Religion & Spirituality, theology. Bookmark the permalink.